Do you remember growing up, the joy of building a makeshift fortress with your pillows, cushions, blankets and whatnot? There is something just so fascinating, all the warmth and coziness you feel playing about in your own little fort and we don't know about you, but thinking about it now still brings a smile to our face every time! Nowadays, a teepee tent for kids is exactly just that - a portable safe haven that your children will enjoy spending time in. Teepees come in different designs and price tags but one thing that is for sure, is that they look good in every setting. 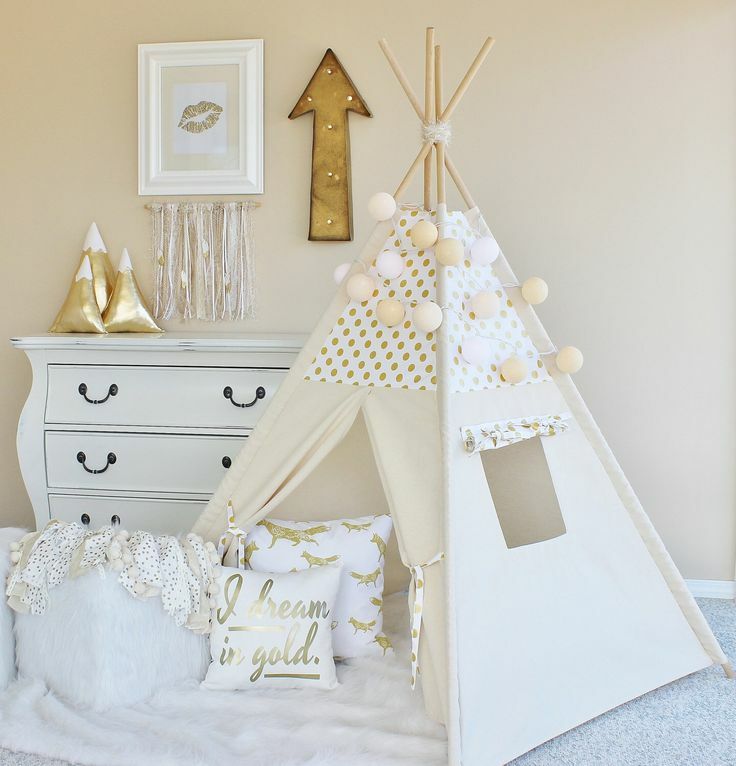 Having a teepee for baby room will instantly light up your interior, we guarantee! Aside from having an instant Pinterest-worthy room, teepees actually do provide many benefits to a child's learning, development and creative imagination. Children, at some point of time (usually 2-3 years of age), desires to be independent and unabashedly pretend play. A teepee gives them just the right amount of privacy to act out the scenarios playing in their mind, with you still having adequate visibility to keep an eye on them. Teepees help kids develop their psychomotor and cognitive skills, aside from enhancing their social and emotional development. It also trains them to become independent and show respect for others so yes, teepees are not just purely aesthetical, they are certainly worth the money spent for the benefits of your child. 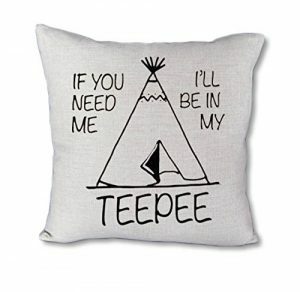 The starting point of choosing the best teepee is material - canvas. 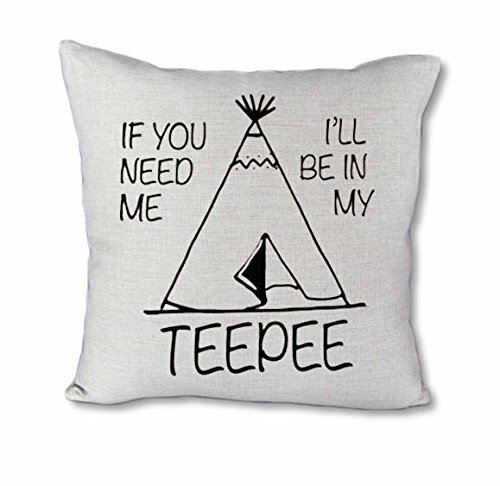 There are many reasons why you should choose a canvas-made teepee. They are breathable, easy to clean and most importantly - durable. This ensures they endure the roughest kids' play, which let's face it, is a pretty frequent occurrence in many households. Our review (not rated in chronological order) below covers different design and price point of canvas teepee for sale in the market, so there's bound to be one that suits your style and budget. We like how it is unpainted, which makes it 100% natural with no toxic finish at all. This means you get a taupe/beige-y colour (the natural colour of canvas) instead of off-white and this makes it easy to maintain. Instead of plastic rods, the tent poles are made of sturdy pine wood that are free of chemical odors and harmful substances. Standing at 5 feet tall, this teepee can fit in any bedroom or nursery. Alternatively, you can set it up as a teepee tent for camping outdoors because it is portable and foldable to fit into the carry case provided, so you can enjoy some quality time outdoors with your child in tow. 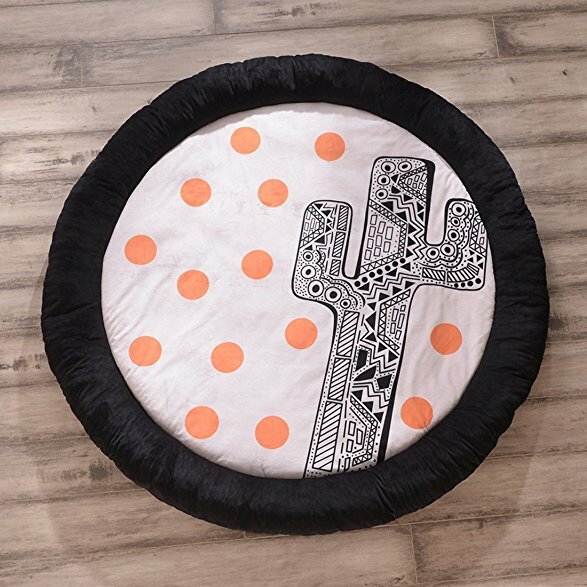 While this teepee can certainly be used as it is, parents often buy a separate floor mat for their kid's ultimate comfort. And it is not expensive to buy both, considering the Little Dove Kid's Foldable Teepee Tent is among the cheap teepees for sale available in the market. 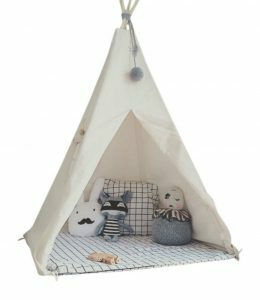 If you are looking for a small teepee for nursery, look no further! Another top teepee for kids room is this Canvas Kids Teepee Children Play Tent by Tiny Land, which is also made of 100% natural, non-toxic, unpainted and breathable cotton canvas. 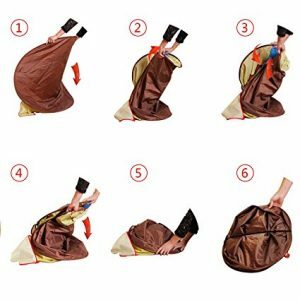 Can be used both indoors and outdoors, this teepee comes with a mat and carry bag for easy portability so you do not need to buy a separate floor mat. Like Little Dove's, this teepee also stands at 5 feet tall which makes it perfect for small spaces such as apartments. With this one, you can adjust its width by moving the wood poles closer together or fully apart, according to your liking. 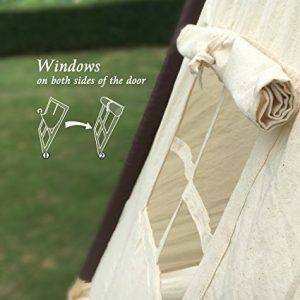 It also has a window for good air circulation and if required, the flap door can be fully closed with string. A teepee like this one is a great for shade in the summer if you're going outdoors. The parts can be easily disassemble to fit into the carry bag for portability and convenience. In terms of quality, the Tiny Land Canvas Kids Teepee Children Play Tent is comparable to that of Little Dove's - its tent poles are also made of sturdy pine wood and is free of chemical odor so you can rest assured your little one is not exposed to any harmful substances. 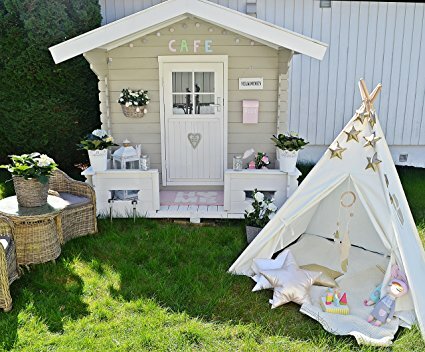 There are many indian teepees for sale in the market, and if you're looking for one in a classic Indian style design, Lavievert Indian Canvas Teepee Children Playhouse is the best play teepee for you. Constructed by 100% cotton canvas and 4 premium pine poles, you can rest assured this is a teepee free from harmful chemical materials. 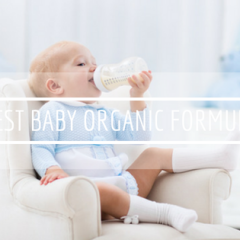 The cotton canvas is natural, breathable, supple and non-irritating, ensuring your little one is always safe and cozy inside. 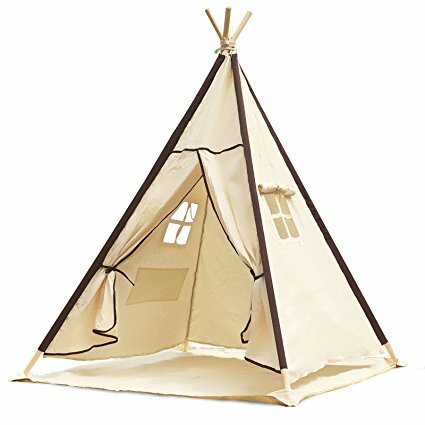 Like most teepees we recommended, this one also has an inner pocket for your child to store their belongings and instead of one, it comes with two windows on both sides of the door. 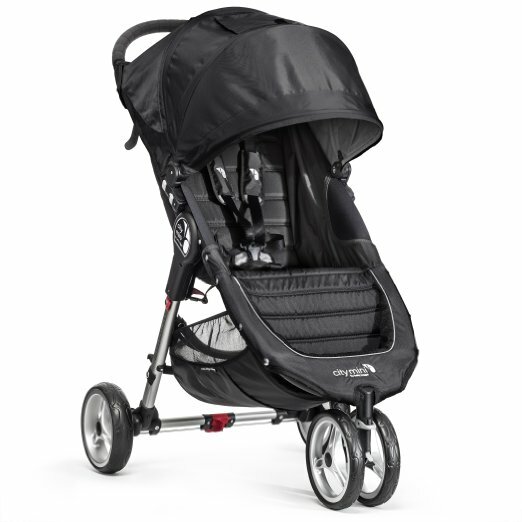 It is easy to assemble by a single adult and it comes with a canvas carry bag for easy portability. The Lavievert Indian Canvas Teepee Children Playhouse is the best teepee tent for camping because it comes with a water-resistant bottom mat that you can choose to roll out at all times, or when it is raining outside. Your outdoor plans will never have to be compromised by the elements anymore! 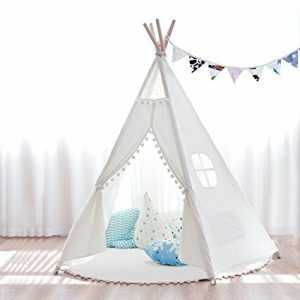 If you are looking for just an indoor teepee for toddlers, the Dream House Classical Indoor Cotton Canvas Teepee is the best choice for you. It is among the best cheap teepee tents for sale in the market, and frankly speaking, if you won't be bringing it anywhere outdoors, this one shall suffix as your little one's hideaway spot. Parents who bought it love how study it stands despite being so affordably inexpensive and it does not have any (fishy) smell thanks to the 100% natural canvas material it employs with no paint and chemicals. 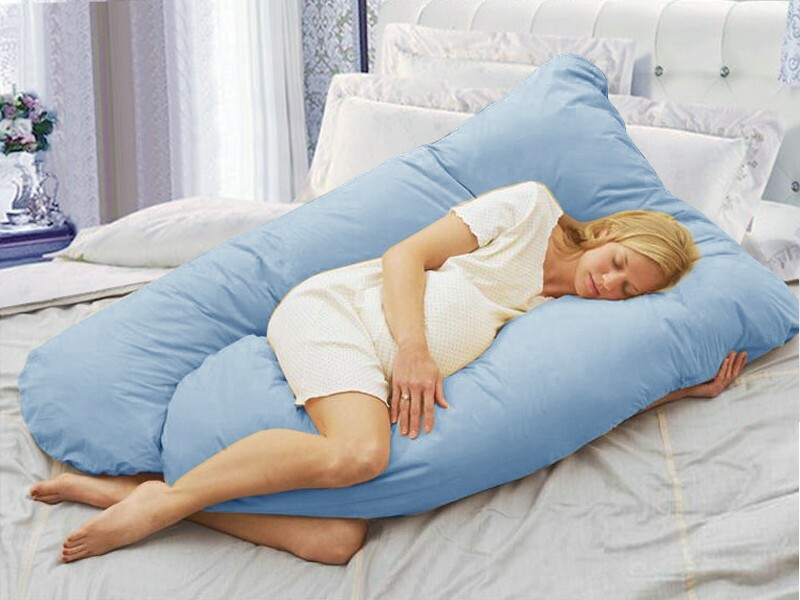 It is large enough to fit two toddlers inside, or 1 adult (sitting position) and 1 toddler. Perfect for you to read your little one his bedtime stories! 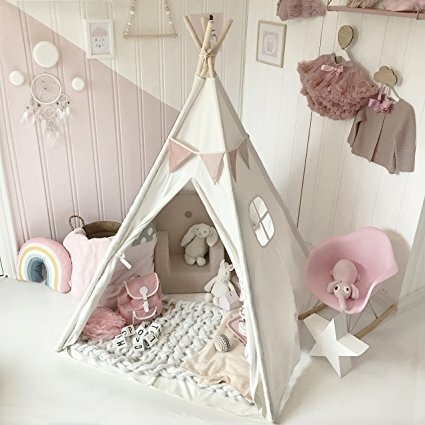 The Dream House Classical Indoor Cotton Canvas Teepee comes in two colours - this solid white and another baby pink and both can be decorated by your little ones themselves to expand their creativity. 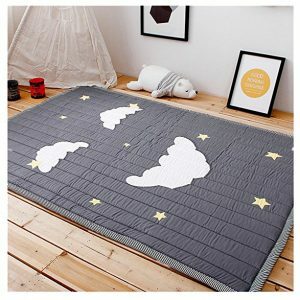 Do note that this does not come with a bottom mat, though it may not be necessary since you will be using it just for indoors, but if you want to provide extra comfort for your little one, you can easily do so by purchasing one of these. If you're wondering if there is any large teepee for sale, yes, there is. The Trademark Innovations Giant Teepee Playhouse is 6" tall and can fit up to 1 adult and 3 toddlers inside, thanks to its large floor base. Among all the indoor tents for toddler, this is one of the most popular teepee because it is durable and priced reasonably for its size and quality. The cover is made of durable cotton canvas while the wood poles are premium New Zealand pines. It comes with a carry case so you can easily bring it outdoors if you want and don't worry about assembling - it can be done quickly and easily by a single adult. Oh, it has an inbuilt bottom mat for ultimate comfort too! Because of its large size, the Trademark Innovations Giant Teepee Playhouse is also a popular indoor teepee for adults. It is a great space for those who want to do some meditating, or really, you don't need any particular reason to utilise one! 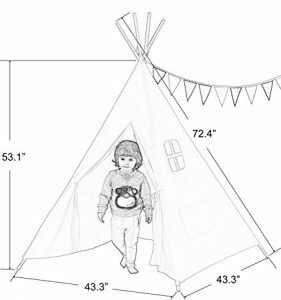 Another large teepee tent for sale is the Joynote Kids Teepee Tent, which also stands at 6 feet tall with a 5-sided design with 5 wooden poles. This makes it ideal for those corner spaces at your playroom, nursery or even living room. The size of this teepee can be adjusted according to your liking. If you want to make it smaller, simply move the poles closer together. Alternatively, move them fully apart to get the maximum space you need of a large teepee. One of the biggest attraction of this teepee is the high quality cotton mat that comes with it. Usually, mats that are included are standard in quality, not with this one. 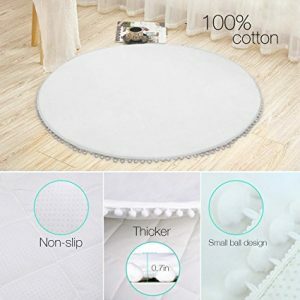 It is made of 100% cotton and is thick in quality with a non-slip feature so that it stays put in place firmly. To add to its stability, it comes with the brand's unique design stable ball to make the tent more stable and not falling. 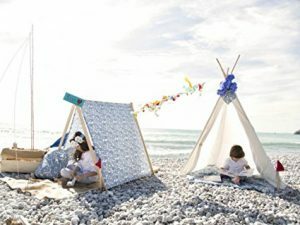 Like all good, authentic teepees for sale, the Joynote Kids Teepee Tent is easy to assemble and disassemble so that you can bring it with you anywhere you want (with the carry bag provided)! 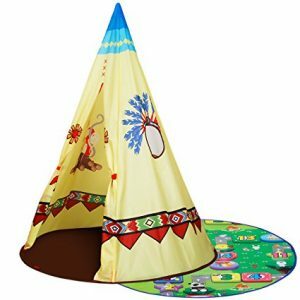 For those looking for a colourful teepee for sale, this bright and cheery Homfu Kids Teepee Play Tent will certainly delight you. This is not your typical teepee - it does not require any assembling or disassembling, simply pop it up when required and fold it back down for easy storage or portability. Keep in mind this is the smallest or most compact when folded so it is very convenient to bring about with you. It also comes with a crawl mat which provides comfort and insulation for your little one, especially if you will be using it outdoors. Don't be fooled by its size, it it roomy enough to house an adult and a child inside comfortably without feeling too cramped. Overall, the Homfu Kids Teepee Play Tent is one of the best cool tents for kids and oh, it is very affordable too! 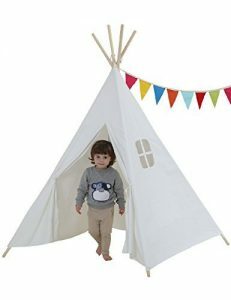 Last but not least, this dreamy Han-MM Floral Classic Ivory Kids Teepee for those with a lil extra budget to spare. 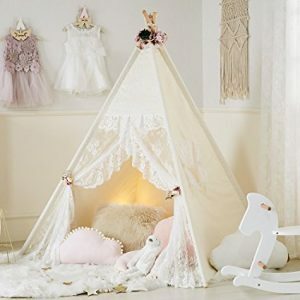 It is the best teepee for girls room, hands down. 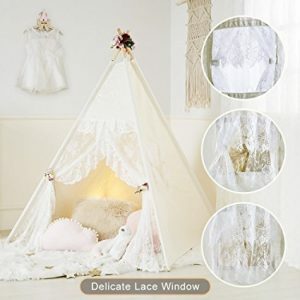 This beautiful teepee will surely set your heart on flutter with its ethereal lace entrance with delicate lace window on the sides. 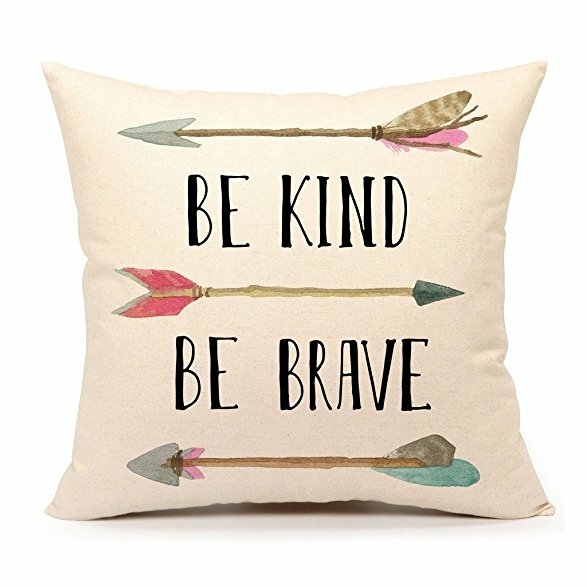 Don't worry, the rest of the material is 100% natural cotton canvas, ensuring it's free of fire retardant and other chemicals. What's even better is that the cotton is pre-shrunk, meaning you do not have to worry about your teepee shrinking if you put it to the wash. This is another teepee that does not require much assembling - it opens and folds like how you would open and close an umbrella so it's perfectly convenient if you need to move it from room to room. It uses solid round poplar wood dowels that are sanded so there is no sharp edges to hurt your kid or your wooden floor. 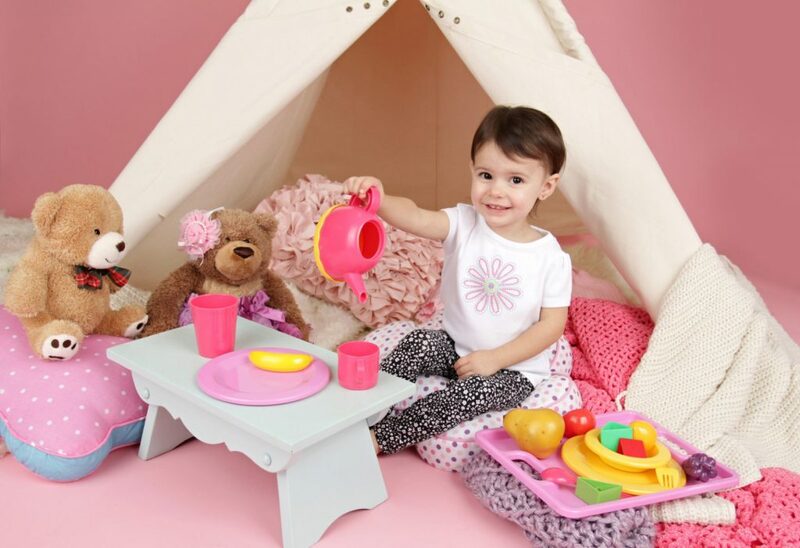 The Han-MM Floral Classic Ivory Kids Teepee will surely put a huge smile (and squeal!) on your little girl's face, alternatively, it makes for the best baby shower gift for your pregnant friends and family! How to make a teepee for kids more endearing and attractive? 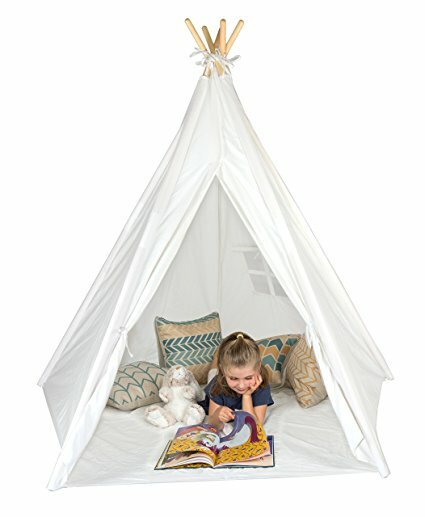 While teepees like Little Dove and Lavievert come in a blank canvas with minimal prints that allow you (and your children) to decorate yourself (think drawings, stickers), when it comes to accessories to dress up your teepee, the most common undoubtedly will be string lights, or fairy lights as some would call it. 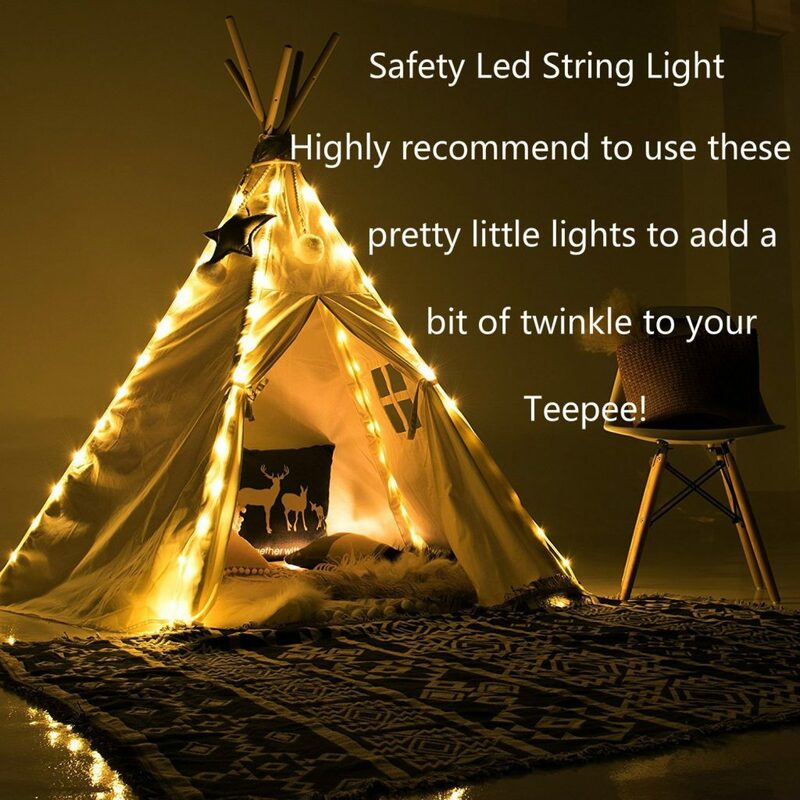 There is just something so magical about a lit teepee that certainly drives your little one to want to spend more time inside, be it playing, reading or even sleeping. Parents find it easier to lure their little one inside (instead of running all around the house!) to read them a bedtime story or generally just to put them to sleep. A good few string lights that we'd recommend is this, this and this, all of which are easy to install, long-lasting and battery-operated. Another easy way to cosy up your little teepee is by layering up the cushions. 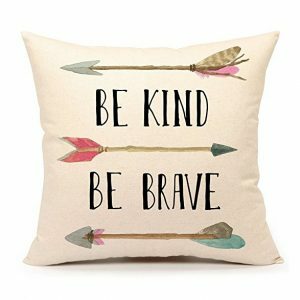 We like how this and this have apt wordings and prints on them, making them look like part of your teepee. Or if you want to stick to the Indian-style theme, this funky one will surely be a favourite of your child! Of course, any cushion and pillows will do if you do not want to spend any on extras. Last but not least, a teepee mat will complete the whole look of a warm and inviting teepee. For those that come with a mat already, you do not need to buy another one but for those that do not, you can consider this and this, which can double up as a play mat for your kids to play on safely. Nutramigen vs Alimentum – Which One Is Better?